Bowie fans have been sharing this gif far and wide, and it is easy to see why. 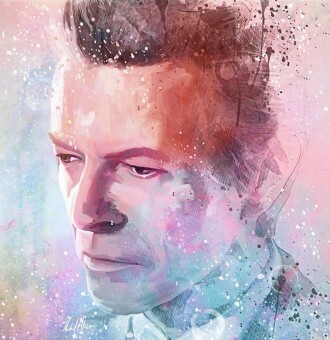 ‘Time may change me’, was originally created to celebrate Bowie’s birthday in 2015. The gif has 29 frames and apparently took Helen Green 35 hours to create. We love the concept that celebrates his life and characters. 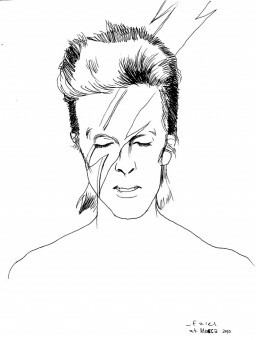 Cartoonist Farel Dalrymple’s take on the album cover for ‘Aladdin Sane’ is simple but impactful. By removing the colour it has a much more poignant feel. This colourful digital illustration was produced by ‘Art of Akers’ and posted yesterday on tumblr. Akers produces beautiful digital portraits of celebrities and iconic figures, including a recent tribute portrait of Lemmy. 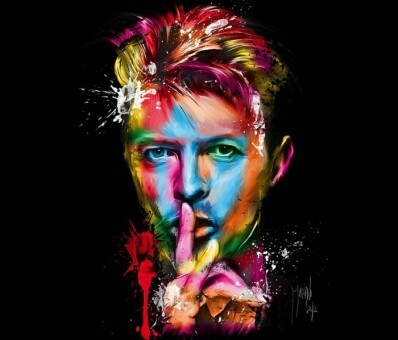 ‘RIP The Legend David Bowie’ by Patrice Murciano is a burst of colour, perfectly capturing his character. littleoil posted this gif on tumblr yesterday with the caption ‘Here am I floating round my tin can; Far above the Moon; Planet Earth is blue; And there’s nothing I can do. R.I.P.’ It has since had 11,744 notes.